Burnley have sealed their third signing in as many days after landing Derby County forward Matej Vydra. The Czech international has signed a three-year-deal, with a further 12-month option, and follows Ben Gibson and Joe Hart in arriving at Turf Moor ahead of Thursday’s deadline. Vydra, who joins for an undisclosed fee, gets the chance to return to the Premier League after brief spells in the top tier with Watford and previously at West Bromwich Albion while on loan from Italian Serie A club Udinese in 2012/13. It is the second successive summer they have signed the Championship’s top scorer after landing Chris Wood last year. And Vydra, 26, feels fully equipped to take on the challenge with the Clarets. “I think five years ago I was like a kid in the Premier League. Now I feel I have more experience in English football, I speak better English and I have learned more in England, so I hope I’m a better player than five years ago,” Vydra told the Clarets’ website. “For the last four years I have been fighting to be in the Premier League. Vydra scored 20 league goals and 22 in total in his first season-long spell at Vicarage Road to be named Championship Player of the Year. The Hornets then completed Vydra’s permanent signing from Udinese but loaned him out to Reading – where he scored nine times in 36 appearances in 2015/16 – before sanctioning a move to Derby County in August, 2016. And the creative frontman now gets the chance to enhance his goalscoring record in the top flight and will add a vital extra attacking option to Sean Dyche’s squad as they prepare to start a third successive Premier League campaign at Southampton next Sunday. “I watched Burnley last season and they played with two strikers which is good for me,” Vydra added. 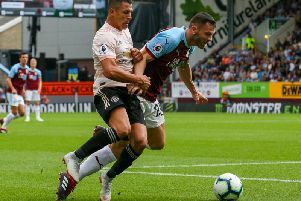 “Last season it looked like no-one liked to come to Burnley’s home stadium and I hope we will carry on with that and also we will play nice football which the fans will love. “The team finished seventh last season. It will be hard to do that again but it’s football and you never know what can happen. “You have to enjoy what we are doing because football is the best job you can do.